Welcome back to IBeautySpy! Today am here with a fun post where I will be showing my lip balms collection. I love collecting lip balms as 1) they are pocket-friendly 2) they rarely cause any allergies unlike other skincare products and 3) simply because I have very dry lips and lip balms get over pretty fast 😀 . Chapstick or tub, tinted or non-tinted, natural or chemical, with SPF or without SPF – I have tried almost all of them. 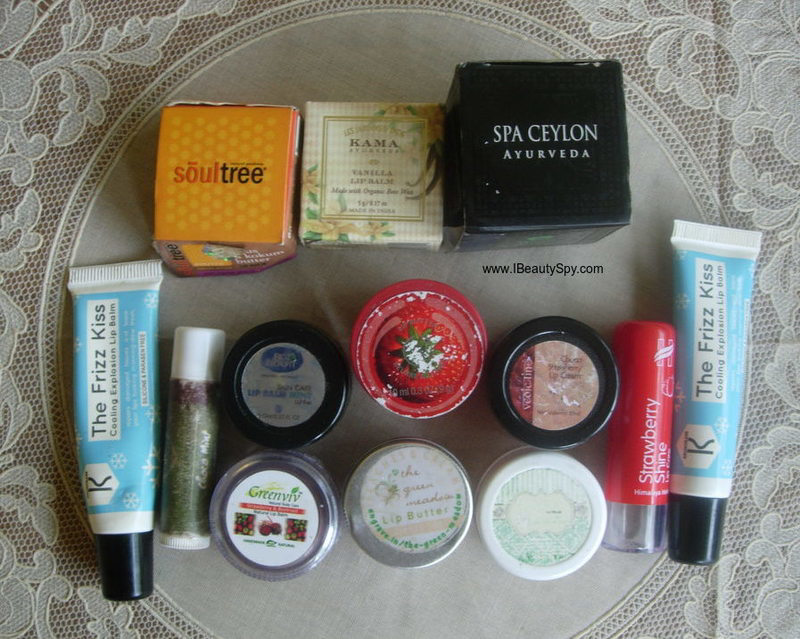 So now am opening the doors of my beauty closet and letting you take a peek in my lips balms drawer. As you can see from the pics, the condition of the products, most of them have been well used. I wouldn’t say these are the best or they are my favorite, but just that this is what am currently owning in my stash. Also, I forgot to click few products mentioned here. So they are not in the pic. So let’s start, shall we? This is my absolute favorite in the lot. It is super nourishing on the lips and heals chapped lips so quickly. Know why? ‘Coz it contains organic ghee along with kokum butter, cocoa butter and seven organic oils – olive oil, castor oil, sunflower oil, coconut oil, apricot oil, almond oil and grapeseed oil. All the ingredients are sourced from certified organic farms. Now you can imagine what wonders it will do for your lips! Earlier it came in a tub packaging, but now when I saw their website they have a chapstick kinda packaging. I would highly recommend you to try this. I love vanilla scents and this lip balm from Kama Ayurveda is pure love in a pot. It is a clear lip balm with a thick texture, though not waxy. The scent of vanilla will want you to lick your lips. Also the staying power is good for 4-5 hours and even after it fades off, my lips don’t become dry. Which means it is really doing its job of repairing lips. I just apply a thick layer of this lip balm on my lips and go to sleep and in the morning, my lips are baby soft and smooth. Another lip balm from a luxury brand. I bought this on a 50% sale. It has an amazing butter-like texture which melts when you apply. The scent of peppermint and spearmint is very refreshing and cooling on the lips. Also it contains nourishing oils like almond, coconut, soya and olive. The new variants of this lip balm come in a squeeze tube packaging instead of the tub one that am having. I have already reviewed this in my blog here. It is a nice lip balm which is 100% natural and made from organic ingredients. However, the mint flavor is more predominant than the chocolate. Being a chocolate lover, that’s the only thing that bothered me 😀 You can check out detailed review of this in my blog. If you are looking for an affordable lip balm which is also free from parabens, formaldehyde, petrochemicals and LLP, you might want to check out these BioBloom lip balms. I have tried two variants from them – Mint & Orange. The lip balm has a gel-like consistency and glides easily on your lips. And its effective as well in healing dry, chapped lips. The staying power also is good for around 3 hours. Contains some nice ingredients like carrot seed oil, aloe vera gel, cocoa butter, coconut oil, vegetable glycerine, castor oil, etc. I am not a big fan of TBS products. But this lip butter is actually good. It has a nice creamy texture and a lovely subtle scent of strawberry. Not very sweet though, but with a hint of sour 😀 I like the fact that it contains cold-pressed strawberry seed oil which is rare to find in a product. It also contains shea butter which is deeply moisturizing. The only thing that I didn’t like about this was that it leaves a white cast on the lips. So I use it only during nights. Performance-wise, it is not as good as the Kama Ayurveda or SoulTree one, but still good enough. And you get more quantity than the others. Read complete review here. This is an okay-ish kinda lip balm. This is also in cream form and has a mix of choco-strawberry scent. But somehow I didn’t like it much. It didn’t do much for my dry lips. Also I have to reapply it every half an hour or so 🙁 Not recommended for dry, chapped lips. Another of my favorites. This is also a deep moisturizing lip balm made with all natural ingredients. It looks red in color but doesn’t give any tint on lips. It contains kokum butter, sweet almond oil, cocoa butter, avocado oil, strawberry extract, beetroot powder, vitamin E and pomegranate essential oil. I like the ingredients list and would probably repurchase this. Good for conditioning dry lips. I received this one in My Envy Box. I never heard of this brand before and didn’t expect much from it. But surprisingly, it turned out to be so good. It has a superb buttery texture and once you take it in your fingertips it will melt into an oil (unless the climate is cold). It nourishes lips and makes it soft and supple. Also heals chapped lips completely in a day or two. You don’t need to reapply this frequently as the staying power is pretty long. And even after I stopped using this, my lips didn’t go back to my previous condition. It has a very subtle vanilla-fruity mix scent. Not artificial, but due to addition of essential oils. Contains kokum butter, mango butter, coconut oil, almond oil, beeswax and essential oils of peach and vanilla. They also have different variants and other interesting products. So do check out their site. Fuschia lip balms are generally harder in consistency, might be due to more quantity of beeswax. They are free from parabens, phthalates and petroleum jelly. It is an average lip balm. Moisturizes lips but doesn’t heal chapped lips or do anything in the long run. I have used the Strawberry Passion variant also which has a beautiful natural pinkish tint. If you like tinted lip balms, you can try that one. This is the favorite lip balm for many college-goers. It is so affordable and college students can’t invest in a lip stick. This one has a subtle red tint. It will show up in your lips as very natural with a hint of shine. If you have pigmented lips, this will be good. Comes in a convenient chapstick form. But its moisturizing capacity is average. I have already reviewed this in my blog here. It is an affordable lip balm which is free from parabens and silicones. The texture is jelly-like and resembles the old Himalaya lip balm which used to come in squeeze tubes priced at Rs.20 or so. Not a bad product. But not that great either. Raw Home Essentials is an Insta page brand offering natural, handmade products. I tried two variants of their lip butter – apple and raspberry. They have added colors and fragrance in them. Though they look red in color, they are not tinted and go colorless on the lips. It has a thick, buttery consistency and nourishes lips well and prevents dryness and chapping. Good one to try. This is one of the worst lip balms I have ever used. I got this mainly because I wanted a lip balm with SPF. But it turned out to be total flop. The texture is neither like a balm nor butter nor gel. It is very thick cream which won’t even spread on the lips. Even if you try to spread it, it just sits on top of your lips like a white layer. Does nothing for your lips. Not recommended at all! This is a lip oil/serum. I have already reviewed it here. The packaging is not travel-friendly, so I can use it only at night when am at home. You would need to top it with a lip butter in case you have very dry lips. This is a lip serum mainly meant for pigmented lips. And lastly, how can I forget my favorite tinted lip balm! Being a non-makeup person, I don’t wear any lipstick. So I use this one from Island Kiss which is one of the best pigmented lip balms I have ever tried. The Berry Blush is a beautiful red shade and tint is transfer-proof. It stays on your lips even after meals and drinking water. The texture of this lip balm feels different and is like a thick oil. Contains organic avocado butter, mango butter and kokum butter. Also has SPF-15 and is free from parabens and petroleum. I have already talked about this much in my blog. It contains cocoa powder along with olive oil, almond oil, kokum butter, sugar and fragrance oil. A delicious treat for your lips. I didn’t like this much. This just felt like powdered sugar mixed with lychee flavor. The flavor also was kinda artificial. So I won’t recommend this. Wow dear! Your collection is great!! 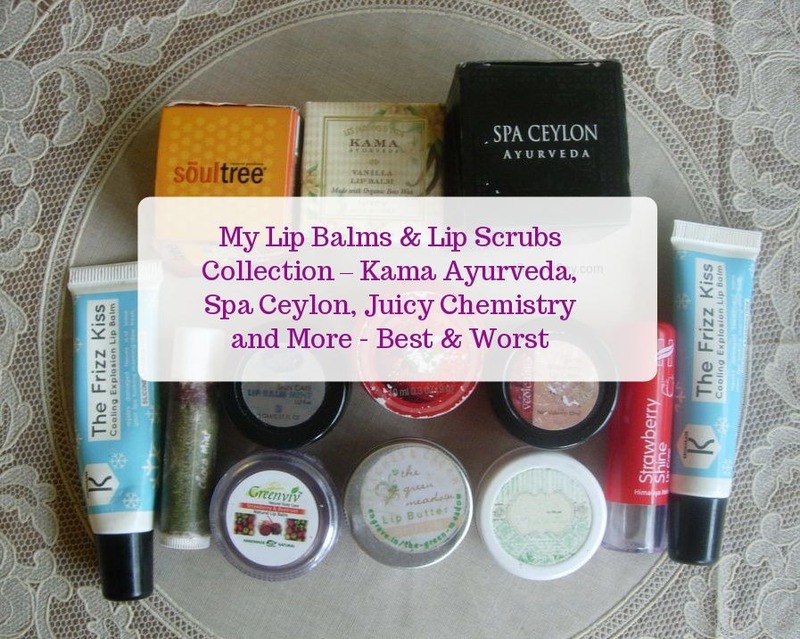 I really want to try out the Spa Ceylon Luxury Ayurveda Wild Mint Lip Balm! Surprisingly I didn’t find TBS lipbalms very effective on my lips.. You have an amazing collection sweets..